My guest in Paul Kirtley Podcast episode 37 is Dan Hume, Bushcraft instructor and author of The Art of Fire. I’ve known Dan since 2006 when I was working on a tracking course and Dan was with us for work experience. The following year Dan joined us on the team at Woodlore. This was during the time I was there as Course Director. Dan and I worked together during a four year period from 2007 to 2010. So, it was a real pleasure to catch up with Dan on this podcast. Even from a young age Dan was dedicated to mastering bushcraft skills and he predictably went on to lead courses himself and, ultimately headed the team at Woodlore. In 2017 his book The Art of Fire was published. 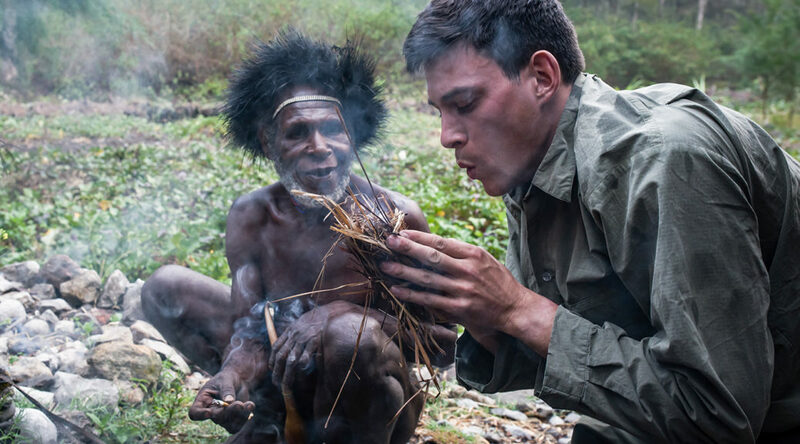 It documents his mission to travel to remote parts of the world and learn first-hand how traditional fire skills are still being relied upon by indigenous peoples to this day. 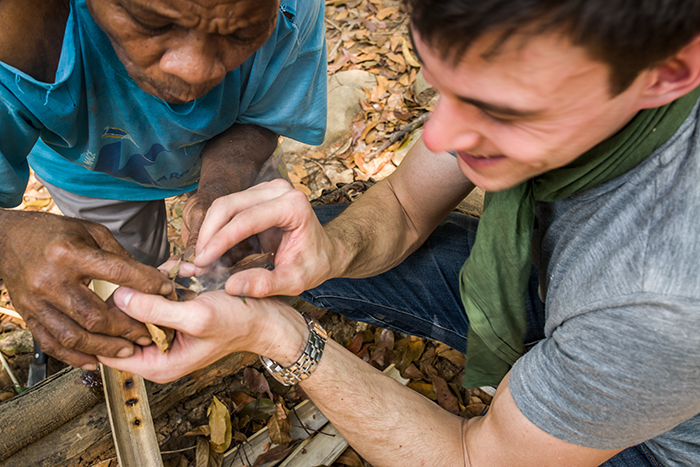 Dan has since left Woodlore and he now splits his time between the UK and Southeast Asia. In our conversation, Dan shares some interesting anecdotes from his quest for fire, as well as some technical details on various fire techniques. He brings us right up-to-date with what he’s doing now and I also ask what Dan’s advice would be to young people who want to pursue a career in bushcraft education after leaving school, as he did. Without further ado, please enjoy the following conversation with Dan Hume…. Also…. subscribe on the dedicated podcast-only RSS feed. 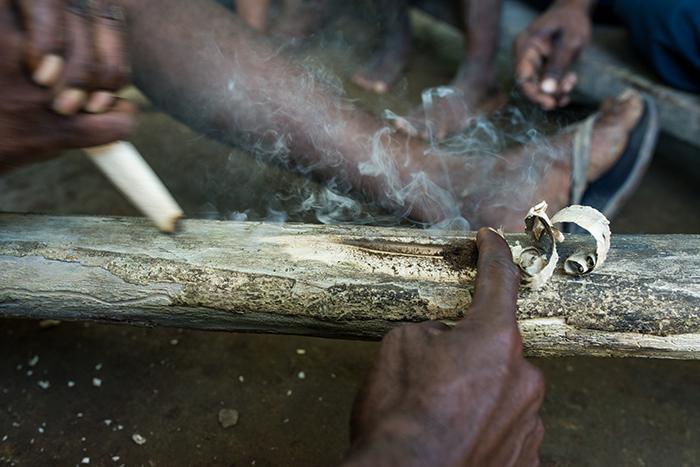 Dan learning about traditional fire skills with the Aeta people in Luzon, Philippines. Photo: Dan Hume. VERY INTERESTING I SPENT OVER A YEAR IN THE MELANESIA AREA, ALL IN THE BUSH, LIKE VITU ISLAND , KAPINGAMARAGI, NEW GEUINEA, NEW IRELAND, MANUS, BOUGAINVILLE, NEW BRITAIN AND COUNTLESS ISLANDS DURING THE 1960-1965 PERIOD. LEARNED TO SPEAK PIDGIN ENGLISH AND A COUPLE OF THE LOCAL DIALECTS. EVEN LEARNED SOME PNG. Hi Jim, thanks for your comments and sharing some of your story. I’m glad you found this podcast interesting and it brought back some memories! Really enjoyed this podcast! My favourite so far! Just ordered Dan’s book, can’t wait to read it & have a go with the fire plough! Thanks for the feedback Jake. Glad you enjoyed it. I’m sure you’ll love Dan’s book! Glad you liked the podcast with Dan. Sorry but I don’t quite understand what you can’t find? Happy to help if I can. Managed a lazy Sunday morn coffee and a tune in to this after a frosty early walk along the River Findhorn. Great to hear you chat with Dan and to hear some more of his story. I admire Dan’s approach, he was my teacher on the Woodlore Fundamental and Journeyman courses and he always took the time to share his passion of the subject around the fire well beyond the teaching elements required, this was inspiring..
I’ve had my copy of the book (from Dan in person) for a year and thoroughly enjoy dipping in as a reference to further my own fascination with making fire. It’s funny isn’t it, it’s only one skill set among so many and there are indeed easy ways to achieve it but like the time you put in to learning about the trees and plants, the wildlife, to find food and use tools (to name a few) understanding and appreciation of this wonderful element runs deeper with the many methods. As always, it’s lovely to hear from you. I’m glad you enjoyed this podcast and found it a worthy accompaniment to Dan’s book. I agree it is wonderful how deeply into different areas we can delve and how this repays us with a deeper understanding and insight. Hope we can catch up again before too long.